Paints and elastomeric coatings are similar in that they always contain three basic elements in a liquid state: pigment, binder, and solvent. In addition, both often contain special additives such as mildew-resistant chemicals. However, paints and coatings differ in their intended uses. Paints are applied only to add decorative color to a substrate. Coatings are applied to water- proof or otherwise protect a substrate. The difference between clear sealers and paints or coatings is that sealers do not contain the pigments that provide the color of paints or coatings. Solvent is added to paints and coatings to lower the material viscosity so it can be applied to a substrate by brush, spray, or roller. The binder and solvent portion of a paint or coating is referred to as the vehicle. A coating referred to as 100 percent solids is merely a binder in a liquid state that cures, usually moisture cured from air humidity, to a seamless film upon application. Thus it is the binder portion, common to all paints and coatings, that imparts the unique characteristics of the material, differentiating coatings from paints. Waterproof coatings are classified generically by their binder type. The type of resin materials added to the coating imparts the waterproofing characteristics of the coating material. Binders are present in the vehicle portion of a coating in either of two types. An emulsion occurs when binders are dispersed or suspended in solvent for purposes of application. Solvent-based materials have the binder dissolved within the solvent. The manner in which solvents leave a binder after application depends upon the type of chemical polymer used in manufacturing. A thermoplastic polymer coating dries by the solvent evaporating and leaving behind the binder film. This is typical of water-based acrylic elastomeric coatings used for waterproofing. A thermosetting polymer reacts chemically or cures with the binder and can become part of the binder film that is formed by this reaction. Examples are epoxy paints, which require the addition and mixing of a catalyst to promote chemical reactions for curing the solvent. The catalyst prompts a chemical reaction that limits application time for these materials before they cure in the material container. This action is referred to as the “pot life” of material (workability time). The chemical reactions necessary for curing create thermosetting polymer vehicles that are more chemically resistant than thermoplastic materials. Thermosetting vehicles produce a harder film and have an ability to contain higher solids content than thermoplastic materials. Resins used in elastomeric coatings are breathable. They allow moisture-vapor trans- mission from the substrate to escape through the coating without causing blisters in the coating film. This is a favorable characteristic for construction details at undersides of bal- conies that are subjected to negative moisture drive. Thermosetting materials such as epoxy paints are not breathable. They will blister or become unbonded from a substrate if subjected to negative moisture drive. Elastomeric coatings are manufactured from acrylic resins with approximately 50 percent solids by volume. Most contain titanium dioxide to prevent chalking during weathering. Additional additives include mildewcides, alkali-resistant chemicals, various volume extenders to increase solids content, and sand or other fillers for texture. Resins used in waterproofing coatings must allow the film to envelop a surface with sufficient dry film millage (thickness of paint measured in millimeters) to produce a film that is watertight, elastic, and breathable. Whereas paints are typically applied 1–4 mil thick, elastomeric coatings are applied 10–20 mil thick. It is this thickness (with the addition of resins or plasticizers that add flexibility to the coating) that creates the waterproof and elastic coating, thus the term elastomeric coating. Elastomeric coatings have the ability to elongate a minimum of 300 percent at dry millage thickness of 12–15 mil. Elongation is tested as the minimum ability of a coating to expand and then return to its original shape with no cracking or splitting (tested according to ASTM D-2370). Elongation should be tested after aging and weathering to check effec- tiveness after exposure to the elements. Elastomeric coatings are available in both solvent-based and water-based vehicles. Water-based vehicles are simpler to apply and not as moisture-sensitive as the solvent- based vehicles. The latter are applied only to totally dry surfaces that require solvent materials for cleanup. Acrylic coatings are extremely sensitive to moisture during their curing process, taking up to 7 days to cure. Should the coating be subjected to moisture during this time, it may reemulsify (return to liquid state). This becomes a critical installation consideration when- ever such coatings are used in a horizontal or slightly inclined surface that might be susceptible to ponding water. 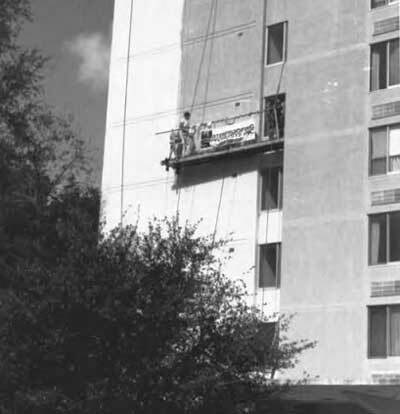 Elastomeric coatings, which are used extensively on stucco finish substrates and exterior insulation finish systems (EIFS), are also used on masonry block, brick, concrete, and wood substrates. Some are available with asphalt primers for application over asphalt finishes. Others have formulations for use on metal and sprayed urethane foam roofs. Elastomeric coatings are also successfully used over previously painted surfaces. By cleaning, preparing the existing surface, repairing cracks (Fig. 3.12), and priming, coatings can be used to protect concrete and masonry surfaces that have deteriorated through weathering and aging (Fig. 3.13). Proper preparation, such as tuck-pointing loose and defective mortar joints and injecting epoxy into cracks, must be completed first. 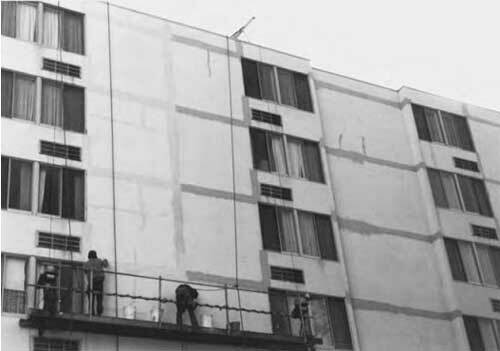 In single-wythe masonry construction, such as split-face block, applying a cementitious block filler is necessary to fill voids in the block before applying elastomeric coating for effective waterproofing. Aesthetically, coatings are available in a wide range of textures and are tintable to any imaginable color. However, deep, dark, tinted colors may fade, or pigments added for coloring may bleed out creating unsightly staining. Heavy textures limit the ability of a coating to perform as an elastomeric due to the amount of filler added to impart texture. Because elastomeric coatings are relatively soft materials (lower tensile strength to impart flexibility), they tend to pick up airborne contaminants. Thus lighter colors, including white, may get dirty quickly. Uniform coating thickness is critical to ensure crack bridging and thermal movement capabilities after application. Applicators should have wet millage gages for controlling the millage of coating applied. This article discusses the design choices required when designing a application specific power resistor. The article focusses on material choices and their implications.